The lost creeks rise again | There once was a creek . . .
There’s nothing like a flood to make you realise where the high and low points of the landscape really are. If someone had asked me, before the floodwaters rose in January 2011, to guess which parts of which streets in Milton, Rosalie and Auchenflower would go under, I would have been doing just that — guessing. When the water did rise, I was struck by how deep it was in some streets (Torwood Street sticks out in my mind), while other streets just nearby were high and dry. This got me thinking about where water belonged in this landscape, and led to the realisation that there once was a creek (or two!) flowing through these suburbs. 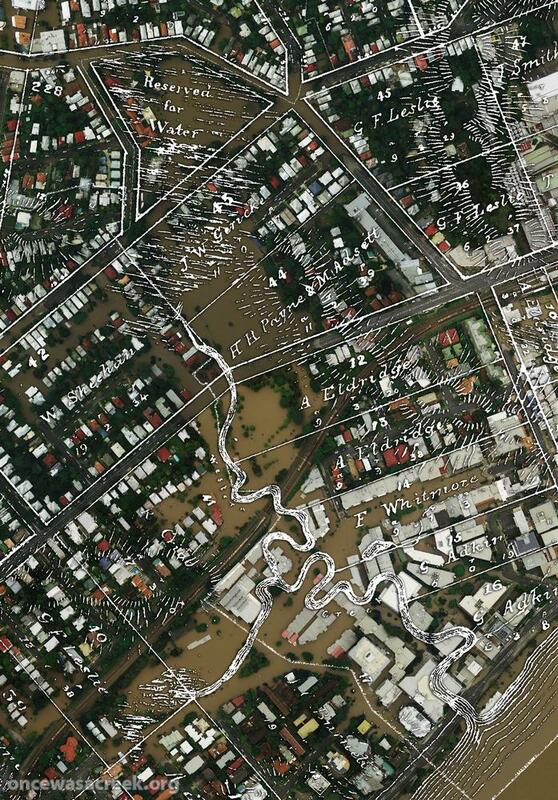 Now that I know where the creek ran, the shape of the floodline makes perfect sense. Though the creek has long been buried or otherwise transformed, its old course still marks out the lowest parts of the suburbs. 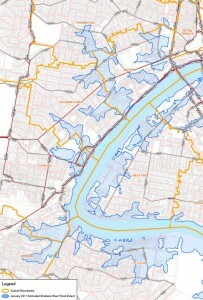 And of course the same goes for other flooded areas as well. 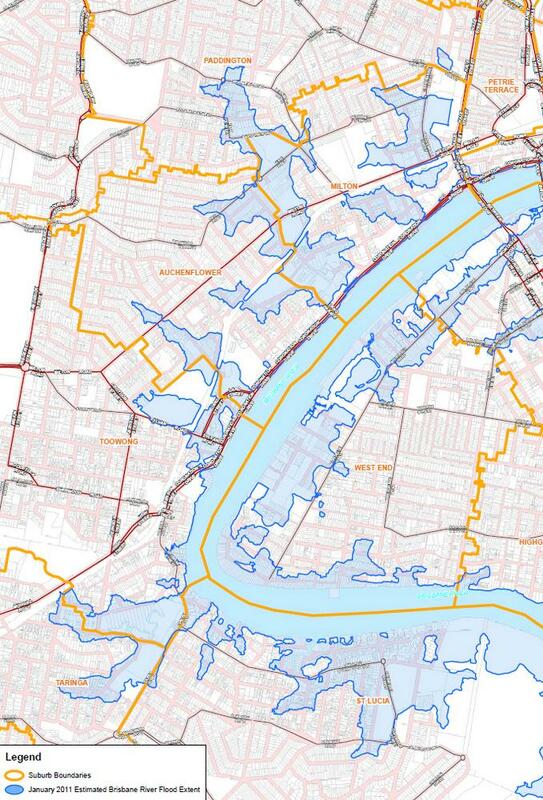 Each area of major flooding along the Milton Reach corresponds with the location of a long-buried creek. The office blocks between Hale Street and Cribb Street, for example, are built right on top of the old Boundary Creek, which continued inland along Castlemaine Street next to Suncorp Stadium, and then into Neal Macrossan Park on the other side of Caxton Street. 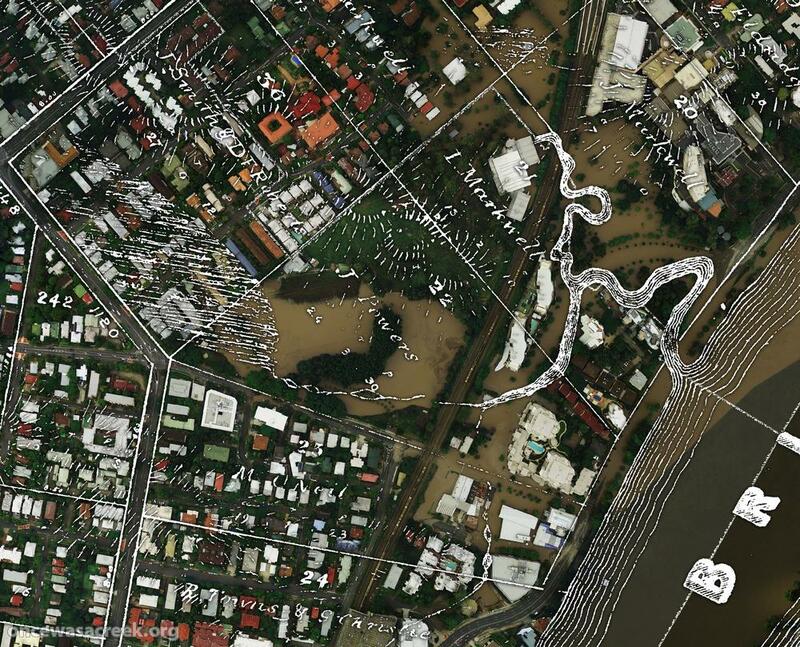 In Auchenflower, the flooding around Moorlands Park, Toowong Memorial Park and McIlwraith Park occurred along what used to be Langsville Creek. You can see the alignment of floodlines and old creeks by looking at the two side by side (see right), but the pictures below bring the past and present together a little more closely. 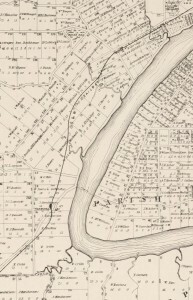 These pictures combine details from maps dating from about 150 years ago with areal photographs from the January 2011 flood. 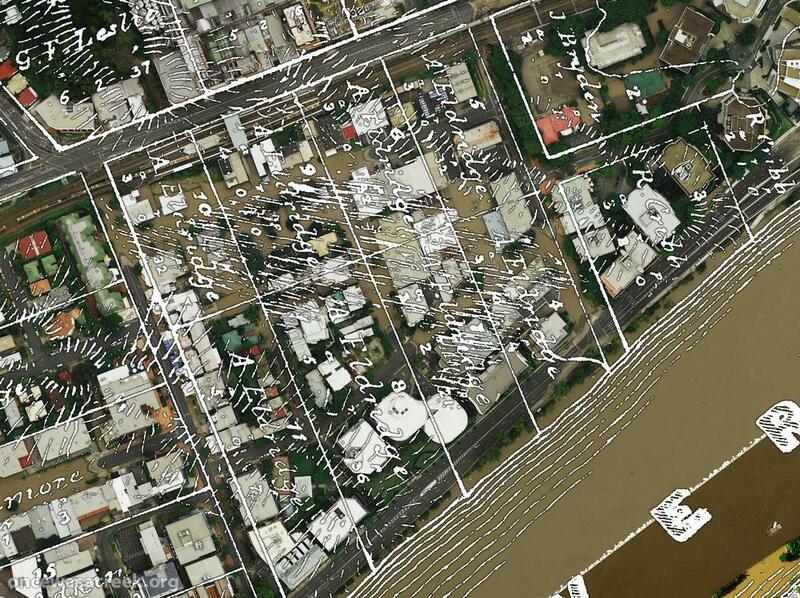 The maps have been digitised (one by the Brisbane City Archives, the other by the Queensland State Archives), Photoshopped (to transform them into inverted monochrome images) and geo-referenced in ArcGIS, a powerful mapping program. 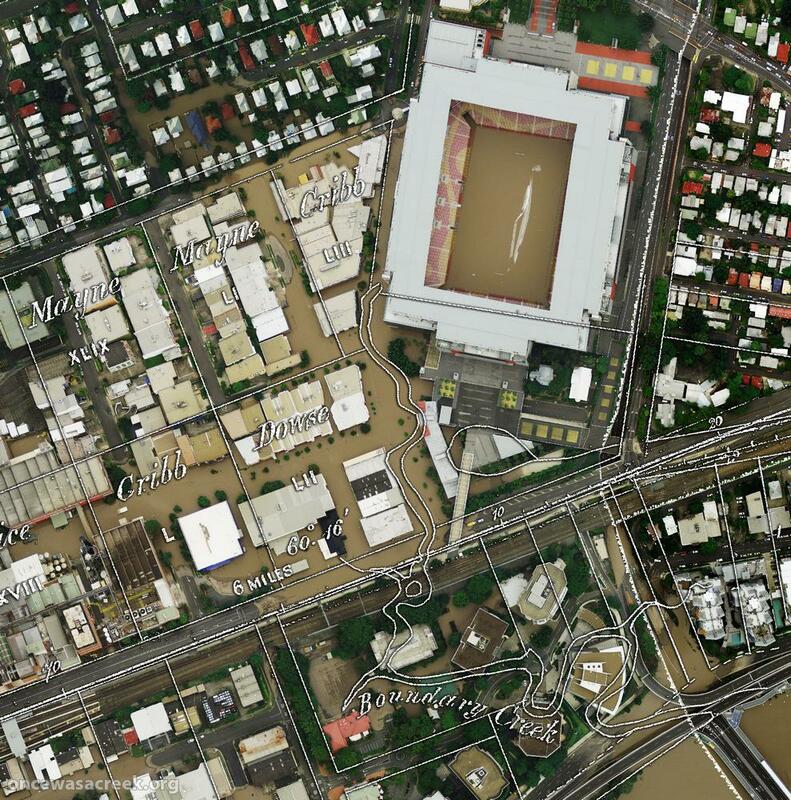 The aerial photos are freely available from the Queensland Government Information Service. Once the natural western boundary of Brisbane Town, this creek flowed through what is now the Coronation Drive Office Park and then alongside what is now Suncorp Stadium (and which was once Brisbane’s general cemetery). 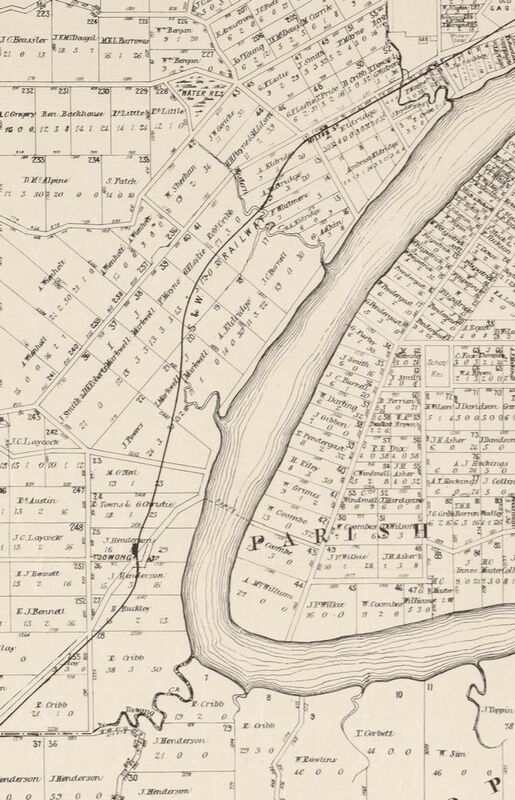 The depiction of the creek below is from a map from 1864 that shows the proposed route of the water mains from Enoggera Creek Reservoir to the Town of Brisbane. The map and the wonderfully detailed digital reproduction from which this is derived are held by the Brisbane City Archives. I have no idea what this lagoon was really called, or if it ever had a name, but it was mentioned in an account of the area from 1872, which described “a fine lagoon” running across the property, where “frequently black swans and an odd pelican or two” could be seen.1 Located between Park Road and Cribb Street, the lagoon is shaded roughly in the image below, and aligns almost exactly with the extent of the floodwater. The map showing this lagoon dates from 1859, and is titled ‘Plan of Portions 203 to 257 in the Environs of Brisbane, Parish of Enoggera, County of Stanley, New South Wales’. You can see it at the Queensland State Archives (Item ID620656) and at the State Library (Record 727379). John Oxley camped by this creek in 1824, but being in the middle of a drought, failed to find any fresh water. Judging from the picture below, however, this would have been a wet place indeed during rainy periods. 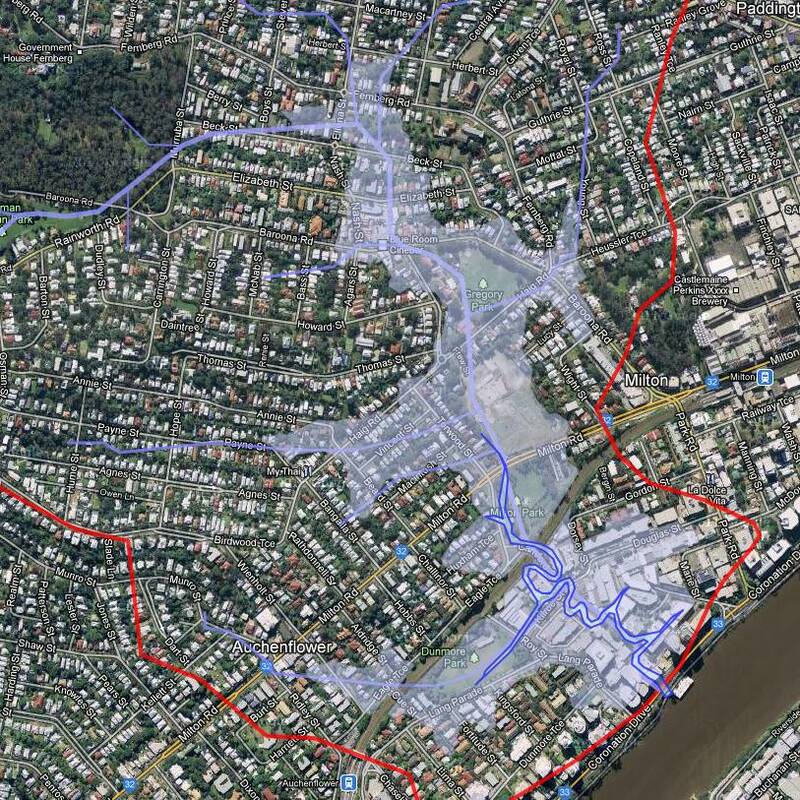 The creek’s branches snaked around Land Street, Moorlands Park, McIlwraith Park and Toowong Memorial Park, all of which flooded. 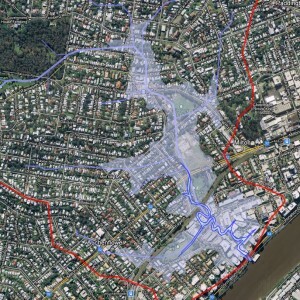 Reaching from Toowong Memorial Park into the neigbouring residential blocks is what appears to be a large swamp or lagoon.